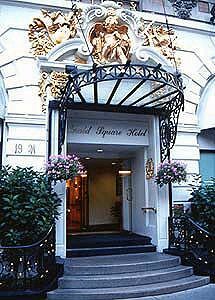 A tourist-class hotel, Herald Square offers clean, comfortable rooms combined with a peaceful atmosphere and friendly service. All rooms include color TV and air conditioning. The hotel is a renovated, landmark building and home to the original Life Magazine. It was recommended by Consumer Reports as a good economy hotel. All of the guest rooms are comfortable and nicely equipped to give a feeling of being home while away from home. The hotel also has a variety of facilities and services that are sure to meet the needs of both business and leisure travellers. The Herald Square is very close to the Empire State Building, Madison Square Garden and Macy's. This and other New York City Hotels & Inns can be found here online in The Register.